Sleek and sporty, solid one piece black ABS hinging cover that locked your tailgate. Strong and Durable The UnderCover SE is made from ABS Composite material and the X-Effect structure on the underside gives it incredible strength and durability. Weather Tight The UnderCover SE has a double seal system helps keep elements out. Light Weight Weighing in at only 58 lbs, the UnderCover SE is the lightest hard-shell tonneau in the industry. Easy to install and Remove. Light System The UnderCover SE comes with a built in LED Lighting System. 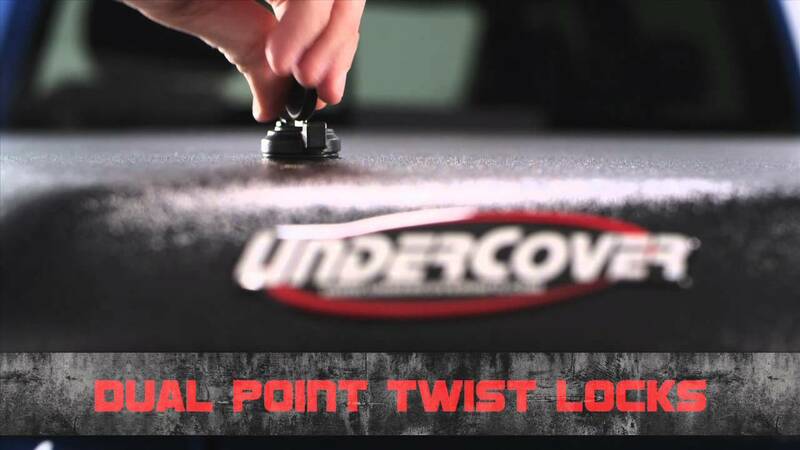 Single Point Lock A single low profile Twist-Lock located in the center of the SE operates latches on both sides of the truck bed; so your valuables stay secure and hidden. The UnderCover SE boasts all the features of the original Classic cover, but with added style lines and a rear spoiler for today's modern truck owner. The raised ribs create an aerodynamic styling, putting this cover in a class of its own. The upgraded single point lock controls both locking hinges on the underside of the cover, providing the same security as the Classic, but with only one key point. The textured black finish is scratch resistant, durable and comes in at a weight of only 58lbs. The SE also comes in a smooth version, ready to paint in any custom color to match your truck. Mounting a SE tonneau cover is very simple and straight-forward. UnderCover has designed the SE with a clamp-on system that takes less than 30 minutes on average. The quick release struts also make taking the cover off easy if you have a large cargo load. UnderCover also includes hardware that allows you to hang the cover on your garage wall, keeping it safe from accidental damage and keeping your garage clear of clutter. The UnderCover SE tonneau cover comes in a contemporary textured black finish and just like all of their other covers, you can have it painted to match. Please keep in mind that the textured surface may prevent the cover color from matching your truck. You won't have to worry about the quality either since UnderCover manufactures their truck bed covers in the USA and offers a 3 year warranty to back up the quality of the cover and a one year warranty on all of the components. The SE is a great way for you to turn your truck bed into a good looking, secure cargo area. The UnderCover SE tonneau cover comes completely assembled and can be quickly installed on your pickup no tools! It can be easily installed with the built in clamps. Each products comes with easy to understand vehicle specific installation instructions.